Happy Wednesday! For the past two years I've been a part of a traveling quilt bee. Our bee is called Fantastic Quilt Voyage, and you can see the blocks we've been making in the hashtag #fantasticquiltvoyage on Instagram. We each started our own quilt, and then it is passed along to each member and they add to it. Last year I shared some of the quilts I've worked on (see that post here), as well as Amanda's Buffy Quilt. Today I want to share the rest of the contributions I made to member quilts. Above are some of the blocks I received back for my quilt. My theme was "make do", and it started with orphaned blocks from my stash. I asked members to take the same type of approach and make something that suited their fancy, in cool colors. Here is the pinterest board for my quilt. First up, Deedrie's quilt! Deedrie is the president of the neutrals fan club, and she sent lots of beautiful neutral and low volume prints for her quilt. Her theme was "be you, bravely", and she hoped to be able to recognize each person through their block. 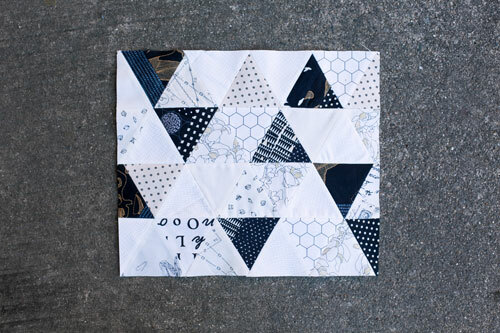 She loves logcabins, small piecing, and traditional piecing with a twist. These are the blocks that had been made by the time the quilt got to me. 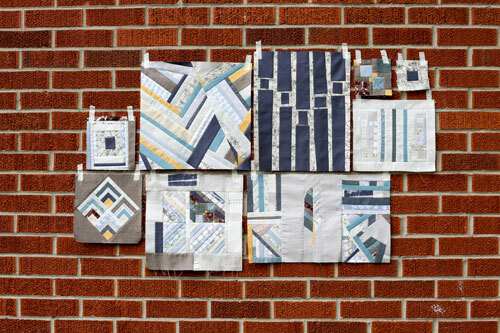 You can see the Pinterest board for her quilt here. Right away, I knew I had to do something with half-square triangles, to make it instantly feel like "me". I added in some quarter-square triangles to add some extra interest. I used the brighter colors as a pop, mixing in more of the light colors than the dark. I loved working in this subtle color palette. So fresh. Next up, is Amanda's quilt. 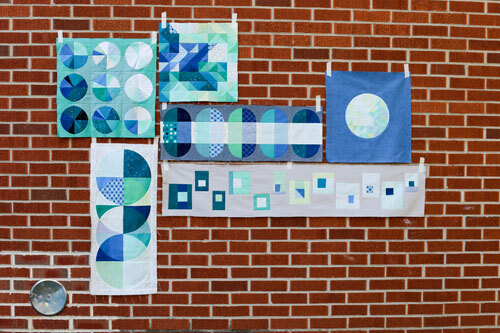 The theme for Amanda's quilt is transparency, with a focus on value and gradients and how colors overlap to create shape. This one was a challenge for me! I loved the blocks that had already been made, and wasn't sure at first how to tackle this vision. You can see the Pinterest board for her quilt here. I ended up making a block that was a twist on my Citrus Peel Quilt. 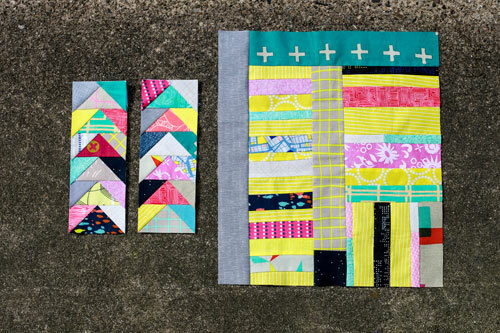 I split the fabrics she sent into darks and lights and played with string blocks to create my block. It was fun, and matching up all those stripes was actually pretty painless! The next quilt I worked on was Holly's. Holly sent along a beautifully curated color palette of fabrics. 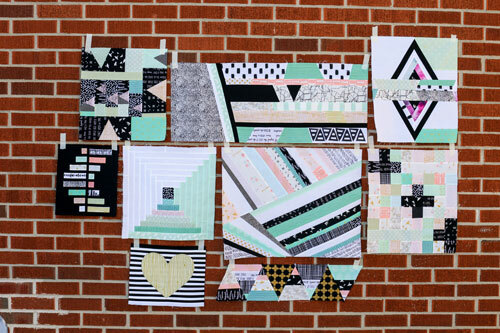 The theme of her quilt was bold and graphic geometric designs with a focus on triangles, stripes, improv and pluses. You can see the Pinterest board for her quilt here. Holly asked each of us to hand paint or print some fabric to be included in our block. I really had fun painting my fabrics. I created two stamps out of cardboard for two of my prints, and used a dry paintbrush for the other print. I used white screen-printing ink. I decided to make a block of flying geese. The focus of her colors was on black and white, so I tried to use the other colors sparingly. It was fun to incorporate the fabrics that I painted and I tried to use up some of the scraps from other blocks too. The next quilt I worked on was Jacey's. Jacey's inspiration to us was this quote: "Be loud. Let your colors show. "- Avett Brother. Her bold color palette featured geometric prints in bright neon colors as well as some neutrals to balance things out. She asked for blocks that focused on shape, stripes, curves, texture, and unexpected elements. So cheerful! 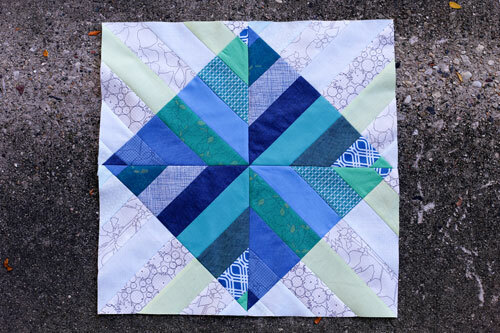 You can see the Pinterest board for her quilt here. 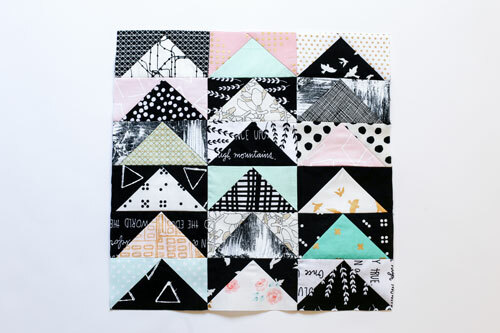 I made a block featuring all strips, which was inspired by this pin from her board. I focused on the highlighter color for that block. 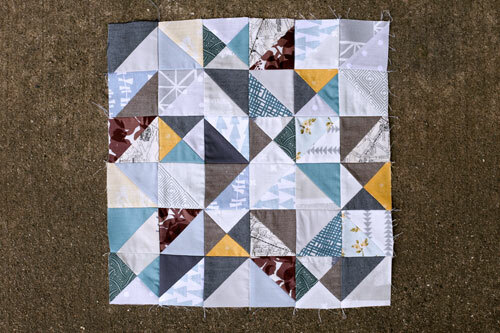 From the scraps that were included, I made two strips of paper pieced flying geese. This was an easy way to use up lots of weirdly shaped scraps. I also pieced together some of the blocks that had been made so far, into bigger chunks. The last quilt I worked on was Nicke's. The theme of her quilt was walking through a winter storm at night. Her palette was strictly whites, creams, and black with bits of gold. 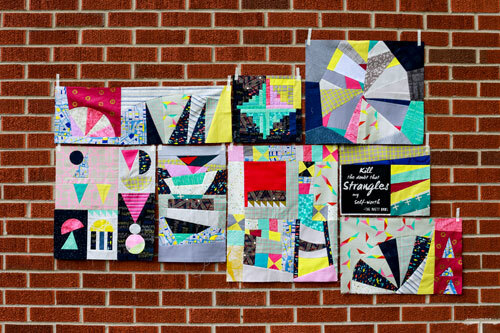 For piecing, she is drawn to simple patchwork, triangles, and improv. 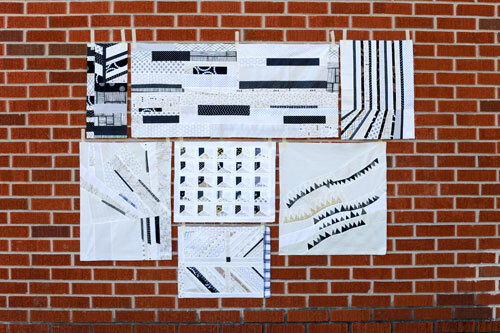 You can see the Pinterest board for her quilt here. For my block, I decided to use equilateral triangles. I made a small block since most of the blocks that had been made already are pretty big. 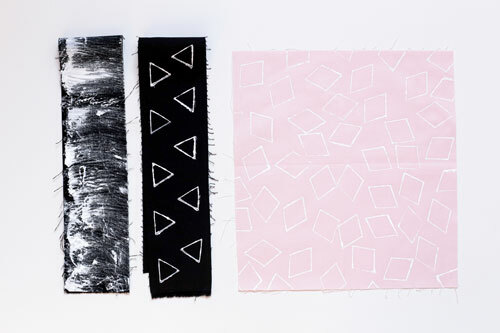 I used primarily light fabrics and pieced strips of the black fabrics for the dark triangles. And that's it! I've now worked on everyone's quilt in the group and I have my quilt blocks back. I'm looking forward to tackling my quilt this Spring. I know I want to make some more blocks, but haven't formulated a plan quite yet. Definitely putting it on my short-list! How interesting to see each person's style, and how you stretched to meet their requests. Look forward to your finished quilt. What an amazing bunch of quilts! You should try to show those qüilts all together, have a special show of just those quilts - how many are there going to be all together? And the stories behind them! Thanks for this and the previous blog post about the bee. 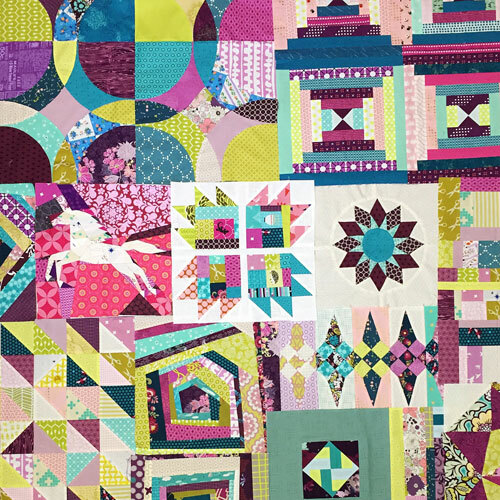 I spent a good hour going through the posts and looking at all the sites and wonderful quilts! I love this "series" in your blog. You are all so creative and I am sure it stretches your own creativity to see what others have done. So much fun, thank you for sharing.